SamTrans Recognizes Veterans – Peninsula Moves! SamTrans employs many military veterans throughout the agency, including mechanics, bus operators, engineers and administrative employees. As a way of demonstrating our gratitude for their contributions, SamTrans is highlighting their stories throughout the year. Enrique Silvas is a Marine Corps. veteran and has been with SamTrans for 13 years. Enrique Silvas was six months from his high school graduation in Gary, Indiana, when he made the decision to join the Marines. “I had been in Junior ROTC for four years and I was offered an Army scholarship but I decided to join the Marines because I liked the colors of the uniforms,” said Silvas. After his discharge in 1981 Silvas went back to Indiana, where, in just a few days, he got a job as truck driver hauling steel. “My military license was good anywhere I wanted to go,” said Silvas. But after just three months he was laid off, a victim of the declining American steel industry. Silvas returned to his old stomping grounds in Southern California where he found a job working for North County Transit District. Serving northern San Diego County, the transit agency is a multi-modal agency similar to SamTrans, operating Breeze bus service, Coaster commuter trains and Sprinter light rail service. Silvas worked for the agency for 18 years, with 14 years as a bus operator before working his way up from dispatcher to trainer and then supervisor. 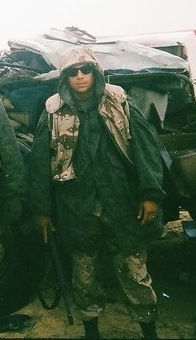 Art Gonzalez joined the US Marines out of high school and served in Iraq during Desert Storm and Desert Shield. 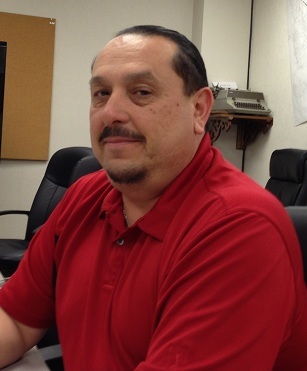 SamTrans Bus Transportation Supervisor Art Gonzalez seems to be on a parallel path with Silvas. Although Gonzalez grew up on the Peninsula, he too decided to join the Marines while still in high school. Gonzalez made an appointment with the Army Recruiter, whose office was at Serramonte Mall. “The day of my appointment, it was pouring. I get to the office and the recruiter isn’t there. I am standing outside in the rain. The Marine recruiter is next door and he sticks his head out the door and says, ‘Are you sure you want to enlist with someone who doesn’t even keep his appointment with you?’” Gonzalez became a Marine. Gonzalez’ father, who was a SamTrans bus operator, was “completely opposed” to his son becoming a Marine. In spite of his objections, he agreed to sign Gonzalez’ enlistment papers when he was 17. As part of the deal, Gonzalez was not required to report for active duty until after he graduated from high school. Two days after graduating from El Camino High School, he was on his way to basic training. After basic training “I was presented with a lot of options,” said Gonzalez and, again over his father’s objections, he chose the infantry. Stationed at Camp Pendleton, Gonzalez became a platoon sergeant for a military police unit. His eight-year enlistment included the deployment of his unit in Desert Storm and Desert Shield. After his discharge, thanks to his training in the Marines, Gonzalez found employment in the security department at North County Transit District. It was at NCTD that Gonzalez and Silvas, two Marine veterans, became colleagues. When Gonzalez moved to SamTrans he encouraged Silvas to do the same.